Today I bought a lawn mower. This is man’s work as far as I’m concerned, engines are messy, lawn mowing hard work but anyway without a man to take over I had no option but to do without. I did my research last week at M. Bricolage where there is a fair selection of machines from the smallest and cheapest available to frankly oversized and overpriced amateur tractors, not quite fitted with cigarette lighters and air conditioning but well on the way to it. We needed something tough, able to leap tall grasses in a single bound, unfrightened by nettles or the ubiquitous ronce and robust enough to truck across uneven ground and face down chunks of concrete and discarded metalwork hidden in the undergrowth. And for myself I need something reliable, easy to maintain and easy to start. Of course, we needed all this for tuppence ha’penny. Today, after discussing it with Paul, I went back to claim my prize. The trouble with the cheapest models, as we’ve found in the UK, is they are unreliable, difficult to start and the wheels fall off which may be a function of the treatment we give them. The fear of buying more expensive sorts is that they won’t be any better. 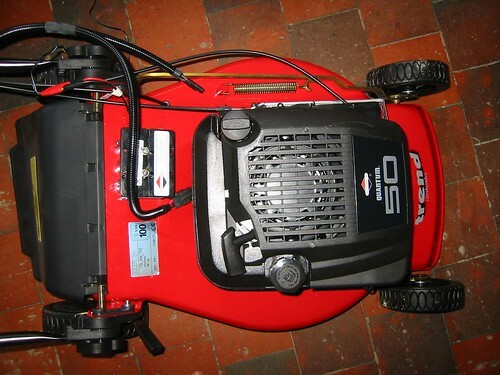 This time I’ve decided to give expense a chance as I fell in love with a sleek Italian beast, bright red with a 5CV Briggs and Stratton engine, metal body, a 51cm cutting width and, the real reason I bought it, electric ignition. There is a tiny sealed 12V battery and starter which I hope will make it possible for me to just mow grass instead of getting hot, sweaty, frustrated and eventually disappointed when my feeble efforts with a pull cord yield no results. It also has a single control to change the height of all the wheels at once and a biggish grass box if ever we achieve sufficient lawn to make collecting the clippings worthwhile. It cost just under 400 euros. The little man designated to help me in the shop was charming. Aware of my pathetic command of the language he jollied me along with baby talk, cheerfully advising on the correct oil and how much, the proper fuel, the need to charge the battery before it would start. Unusually I hadn’t chosen the last item in stock, so there was a cleanly boxed and sealed piece of merchandise to take to the checkout. Unfortunately it was on the top shelf of an extremely high storage area. He got the ladder and tried the box, he went and got a fork lift trolley and then he went and got another man to help and finally they got the box down.. He tenderly opened it and checked everything was in order, found me the instruction booklet and entreated me to read it well. After negotiating the checkout, where everyone advised me to retain my proof of purchase even the people in the queue, we tried to fit it in the car. Alas, that beautiful box was too much volume and all the parts had to be decanted around the boot and passenger areas. I don’t think we left anything behind. Instructions for the engine are in English as well as 10 other languages. This is comforting, despite my little chevalier’s exhortations over the correct places for oil and fuel I shouldn’t like to get this wrong. Instructions for assembling the grass collector, stone guard and controls was in French translated from the Italian. I think I’ve got it right, there was a tiny circlip destined to secure the stone guard in place which pinged away from me as I tried to fit it. I can retrofit it if I ever find it, and for the time being at least the stone guard shows no sign of falling off. The grass box is two pieces of plastic that need to be clipped together to form a cat basket, I’m sure Bagheera will get more use out of it than we do. Now all that is left to do is charge the battery. There is a small wall wart supplied which should do the job in 24 hours, I’m not sure I can wait that long, it’s all so exciting. So, does it work ? We also bought a new lawn mower recently... but just a cheap flymo. Well, the biggest flymo we could get, as I like big things, but it's still just made of plastic. However, it did a good job of the back garden.